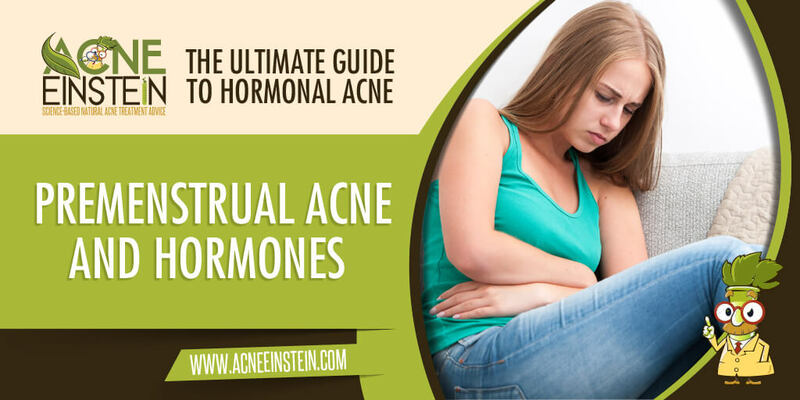 Acne before periods is a sure sign of hormonal acne. During a woman’s cycle her hormones fluctuate in a way that makes breaking out more likely. Women with hormonal acne often break out before periods, and this is sometimes referred as premenstrual acne. The breakout is caused by fluctuations in hormone levels (mainly estrogen and progesterone) during the menstrual cycle. During the first half of a woman’s cycle (the follicular phase), estrogen is the dominant hormone, whereas progesterone increases rapidly after ovulation and dominates the second half of the cycle (the luteal phase). Testosterone levels remain relatively stable throughout the cycle. This change in the ratio of estrogen and progesterone and estrogen and testosterone explains the changes in the skin during the cycle. During the first half of the cycle, estrogen balances the effects of testosterone and keeps sebum production under control and the skin look nice. Estrogen levels drop after ovulation while progesterone levels increase. Without the balancing effect of estrogen, testosterone stimulates the sebaceous glands to produce more sebum. Increase in progesterone levels likely further stimulates sebum production. The end result of these hormonal fluctuations is that the skin becomes oily and you are more likely to get acne.